A cool amp. If your budget is any sort of an issue, but you can afford the Vibro, you should get one as nothing beats it on tone and ease of use. 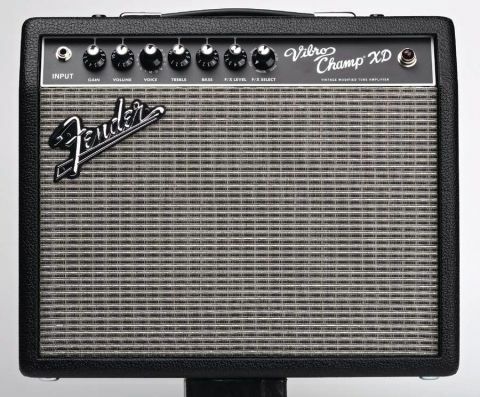 The Vibro offers a wealth of classic Fender tones at a great price. Metal voicings can become way too harsh. The Vibro Champ has 12AX7A and 6V6 valves. The inclusion of modulation effects within Fender amps has a long history. The tremolo-equipped Tremolux, introduced in 1955, and the 1956 Vibrolux boasting a sumptuous vibrato, are just two examples from the illustrious annals. And that classic spring reverb is a significant part of anyone's definition of 'the Fender sound'. This new small combo, introduced into the Vintage Modified series, mixes an all-valve configuration with a number of specific preamp voicings and on-board DSP effects. Featuring the blackface livery admired the world over, offering a low output and a straightforward operation, it's likely to have a wide appeal. The amp offers a 16-way rotary encoder that selects a number of preset preamp voicings that drastically alter the basic tone which can, of course, be tailored further by experimenting with the output stage. These voicings are listed in the amp's manual and the majority are based - rather than authentically modelled - on classic Fender amps. The Tweed and Blackface sections each offer three choices based on differing drive settings and you can alter the amp's gain pot to suit. There are two full-blooded metal tones, a soupy jazz option and even a pseudo acoustic tone based on an Acoustasonic. Add three British settings that tip their hat to either Vox or Marshall, and you theoretically have pretty much any tone you could realistically need. The two-way EQ is extremely efficient too. The Vibro Champ needs just a single 6V6 to kick out its rated five watts. It uses just an eight-inch speaker too. The provision of DSP effects is a leap forward for Fender and although only their level can be controlled in real time, via the dedicated control on the front panel, each specific effect is offered with a number of set yet different parameters: the delay, for example, is available in three contrasting lengths. There are 16 effect presets in total which include the three delays, a trio of tremolos and a number of classic reverbs. It's also possible to combine a reverb with delay or either with a chorus thanks to a thoughtful inclusion of such a mix within the FX Select control's parameters. The choice of effects represents a good spread, but there are some noticeable omissions: there's no flanger or phaser, for example - these make way for more 'Vibratone' selections. The classic Fender voicings are all present and correct and although we'd never suggest that the combo here offers a better tone than a vintage Twin or Bassman, the relevant voicings are certainly in the right ballpark. Voicing Two, described as a fat Fender Bassman, is excellent fun to play around with and adding reverb and delay gets you straight into mellow rockabilly territory. The heavily-driven Blackface voicing is sheer Stevie Ray, offering the classic vibrancy of a 6L6 power valve with a sweetness afforded by a Strat's neck pickup: for extra sugar, the spring reverb effect is excellent. The metal settings, while satisfyingly filthy, tend to be very toppy indeed, so be prepared to roll three-quarters of the treble off in order to keep your skull intact. This high-end is accentuated by the Vibro Champ's small speaker but, as remarked upon previously, the EQ seems good enough to cope. Elsewhere the tremolo is warm and throbby, as is the Vibratone, and although we found the chorus a little too mechanical for our tastes, the provision of adding reverb or delay is a sensible one to improve proceedings. The unqualified ace in the hole is when you feed it through a bigger speaker cabinet. We used our stock Orange 4 x 12 and found that, with the cab's additional projection and headroom, the Vibro Champ XD is loud enough for small gigs. What's more, the Fender tones really come into their own and have some of the sharper textures sanded off with ease. It's just a shame - albeit a perfectly understandable one - that the amp isn't ever so slightly more versatile in the switching stakes. This amp bridges the gap between a practice and gigging unit, and if you're in the market for a fistful of all-valve Fender combo yet find your wallet wanting, getting this and tracking down a reasonably-sized external cabinet is a definite option to consider seriously. Take care with your settings as channel gain can effect the voicings, but if you commit six or so settings to memory and dial them in on the fly, you can get yourself a genuinely impressive, Fender-flavoured rig for not a great deal of money. What's not to like about that?